A White Flash and The Marvel Universe is Changed! Amazingly, after the success of X-Men arcs like “Days of Future Past” in the 80’s and Age of Apocalypse in the 90’s, Marvel was fairly patient getting to their alternate reality X-drama this decade. The wait is well worth it, as House of M offers arguably the best Marvel event of the 2000’s, piggy-backing off the developments of Avengers Disassembled and catapulting into a brave new world of mutants and M’s. You can view the Trade Reading Timeline for House of M below, along with an issue-by-issue rundown for Marvel Unlimited to close. As always, if you have questions or concerns with the order, feel free to contact Comic Book Herald. Enjoy! This trade is considered a House of M prelude. Issue number 14 is good and a worthwhile prelude to the story, but this trade as a whole is for completists and Claremont fanatics only. This series was actually released a few years after House of M, but it develops Magneto’s rise to power in the House of M universe. As with any of the major events, technically, reading the entire trade will overlap many of the earlier tie-in issues. You can see the issue by issue breakdown below, but personally I enjoy consuming the entire event trade and then going back and filling in the details with the tie-ins. With the good ones (and House of M is among the good ones), you won’t feel like you’re missing anything. Like House of M: Civil War, both of the previous trades were written a few years after House of M to fill in the history of the universe. As far as the chronology of the House of M universe goes, these two trades technically occur before House of M and you could read them as such. I include them after because I prefer the knowledge of the main event, but the choice is yours. Do ya thing, baby girl, do ya thing. 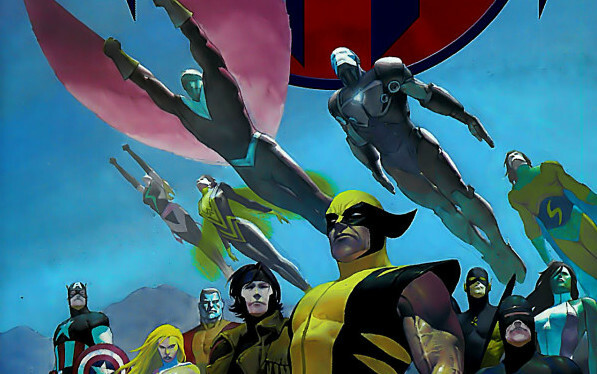 Several of the House of M tie-ins are packaged together as trades, although this has more to do with convenience and size of the trade than any connection between the arcs. In this case, Fantastic Four should be read before Iron Man. In addition to the Wolverine collection, this trade collects the Captain America, Black Panther, Cable & Deadpool, and The Pulse tie-ins. This trade (only look at the name after you’ve finished House of M!!!) collects the less prominent mutant lines throughout the House of M universe, along with the giant-size Ms. Marvel tie-in and a Decimation lead-in. Decimation comes next in the trade reading order, so definitely save this “Day After” issue for last! As I mentioned in the Avengers Disassembled guide, I do not recommend the Exaclibur trade. It has a lot of potential as a series featuring Magneto and Professor X, but the execution is abysmal. Technically Marvel Unlimited orders these issues differently (pretty much by publication date) but the next few issues won’t make nearly as much sense if you haven’t at least covered the first two issues of the main House of M arc. I believe the pulse 10 should come after house of M 5, it deals with how hawkeye reacts to learning the truth. If you read House of M: Civil War before the main House of M storyline, you find out Charles Xavier dies during Magneto’s rise to power. This spoils what you otherwise wouldn’t find out until the last panel of House of M #5. Not a huge deal, but it did take away some of the suspense for me while the heroes are searching for Magneto and Xavier. Maybe Civil War: House of M would be better after reading the main storyline first? Yeah, it gives you some side Captain Britain. Are you going to upgrade the List in the near future to reflect the addition of the trade (and its Issues) for both Orders? As well as adding the issues of Civil War: House of M, House of M : Avengers and House of M: Masters of Evil to the Marvel Unlimited Issue-by-Issue Order ? Where respectively when would you read them or could you maybe update the Issue by Issue Order by putting these issues in ? Really appreciate your great work here and I am a proud member of the reading club alas being years behind *hide*. I believe you could read them both in order prior to the core House of M #1. Builds the universe before the main event starts up. New Thunderbolts #11 is already included in the previous section of the guide, where you have people read through issue #12. Also, New X-Men #7-15 are not included in the Part 3 issue list. This is one example of many where event-relevant portions of a series are included in the guide sections, but other issues are omitted. Have you considered making a giant list that includes all issues of every series mentioned in your guide? Don’t take these as knocks, as I find your guides extremely helpful. I am just trying to provide some constructive feedback. I suggest adding a link to “Marvel Comics Between House of M & Civil War” for those that prefer to skip Decimation. Just checked, they are available, but where to read them chronologically? Just at this part of your reading order and am curious. Obviously you’ve given two options here: the trade reading order and the individual issues order. But since I’m reading on Marvel Unlimited, I guess I could do either. I’m curious as to what you think the best way to read these events is? I think I’m coming to the realization that I’d rather keep the entire small stories together than have everything in strict chronological order. Even at the cost of spoiling a few things. You mention that approach works for House of M, but would it work for Civil War too? And others? I don’t mind some back and forth, but reading 12 other comics in between parts of the Spider-man story appeals less. I realise you’re asking Dave, but FWIW I read CW and HoM on MU as if I was reading the TPBs; all of one title at a time. I first tried reading the individual issues in strict chronological order, but gave up because I couldn’t follow all those stories at once. It’s a good question. In print I generally like to read the issues in order, but this is also the least convenient approach within Marvel Unlimited. Due to the back and forth required, I prefer just continuing on with each series and clicking “read next”. There are instances when this is more of a problem, or at least a less enjoyable reading experience. Amazing Spider-Man during Civil War is best read in the order I’ve provided, as the events of the main series unfold. As an event, Civil War is a lot more chronologically tied together than House of M, which works pretty well in chunks. Otherwise, I often recommend just reading the main series first all the way through. This saves you from spoilers in the pages of any tie-ins once you start diving in. Naturally, a ton comes down to personal preference. I want to read the Marvel comics, and here’s a plan I have: I would start with the main Avengers Dissassembled story arc, then just follow the New Avengers series up till Seige, where I would then swicth to Heroic Age Avengers. Using your guide I will also read some of the main events along the way including House of M and Civil War, but not worry so much about the tie-ins. Would that work? Where does Mutopia X 5 (of 5) fall in the reading order? Was it intentionally excluded? I’ve read up to the 4th and have stopped my reading there. So far, I’m finding it the most interesting of the minis. Good stuff. And of course, thank you for the terrific guide! You’ll have to wait for Decimation (right after House of M) 🙂 Glad you enjoy the guide! Where does HOM: No More Mutants fall on here? Also, do you know when they plan to offer it in paperback? I read through House of M using your/Marvel Unlimited Official Guide (the 49 issues above). I came today just to check but I had assumed the Trade series would be tied off in the Official Guide below. This isn’t the case. From the Trade List above, House of M: Masters of Evil/Avengers/Civil War are all available on Unlimited but DON’T form part of the Official Guide which is strange. The series you mentioned were all published a few years after the actual House of M event, and can be read as prologue setting up the House of M universe. It seems that House of M: Masters of Evil is 4 issues, not 5. Thanks for a helpful guide. You’re quite welcome, and thanks for the feedback! Guide is updated. Also If this if this is part 4 then what was part 3? That is what I’ve been doing, but the list is pretty confusing. I assumed that since some of the links led to pages that were numbered (Part 1, Part 2 etc) that those were main events and that the other pages were not. But some numbers are missing. Part 3 is one of them. It would be really helpful if you included the volume numbers because it is hard to follow for someone who is not familiar with which volumes are for which events. I at first was having the same problem. I quickly realized that house of M was a 2005 production. So I look at the volume that covers that year. I don’t have to hunt for the right comic. just look at the first comic in the series. Look for the comic series that covers the same year and you are good.